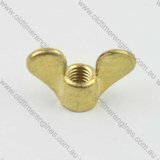 A nice reproduction brass wing nut for the oil filler flap of all Lister CS engines. 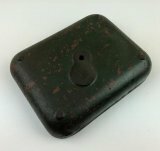 It is also suitable for many other Lister stationary engines, or any other use requiring a 5/16 BSW brass wing nut. 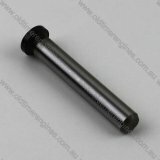 A new replacement lower external oil pipe for original Lister CS engines. This is the connecting suction pipe between the sump strainer and the bottom of the oil pump. Electro plated for protection against the elements. 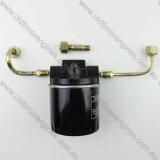 A oil filter kit that replaces existing external steel or copper pipe that runs between the oil pump and mains oil line to enable you to have the inline filter installed after the oil pump on your original English built Lister CS or Indian Listeroid engine, returning clean filtered oil to the crank case. 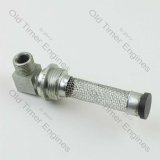 This kit is not suitable for radiator cooled CS engines. A complete high quality replacement oil pump assembly for all single cylinder Lister CS and VA engines. Finished to a very high standard and made from superior gun metal, these pumps come complete and ready to bolt to your engine. An equivalent replacement plunger for Lister CS oil pumps, this is not brass like the original ones, but it does the same job. 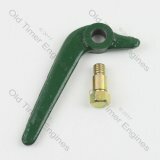 A new replacement solid cast iron oil pump priming lever complete with the correct type bolt. 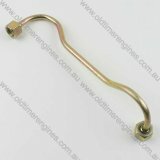 This lever will fit Lister CS engines, as well as Lister L & J type engines fitted with this style of oil pump priming lever. An oil pump rebuild kit containing the parts needed for overhauling your original brass body Lister CS oil pump. 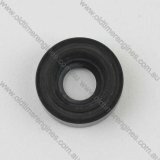 A good quality 5/8" oil seal for Lister CS oil pumps. This seal is a light press fit in top section of the oil pump body and seals around the plunger. Equivalent to Lister part number 008-02178. 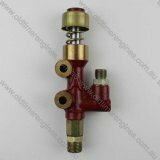 A replacement CS oil pump tappet and end pin, this drives the oil pump and in very often worn or broken. 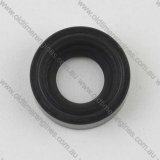 A good quality 1/2" oil seal used for sealing around the oil pump tappet in the bottom section of the Lister CS cam shaft cast housing. Equivalent to Lister part number 088-02177. A Lister CS oil strainer assembly, complete with a strong magnet to help remove any small metal particles from your engines oil. 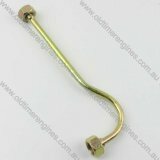 A new replacement upper external oil pipe for original Lister CS engines. This is the oil return pipe connecting between the top of the oil pump and the oil feed lines to the bearings.